The guitar that Bee Gee Maurice Gibb used to compose the band's first disco hit - Jive Talkin' - is to be sold at auction next month. He famously wrote the track after driving across a bridge in Florida and hearing the rhythm made by the car's tyres on the road surface. 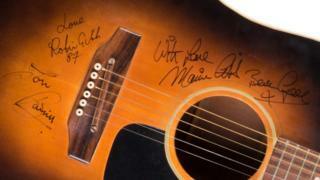 The guitar, signed by all three Gibb brothers, was given away as a prize on Bruno Brookes' Radio 1 show in 1987. The Gibson J45 could fetch more than £10,000 at auction in Wiltshire. Image caption The two Bee Gees guitars are said to be "exceptionally rare"
The winner of the guitar later sold it in an episode of the Channel 4 TV programme Four Rooms in 2014. A custom-made 1968 Gibson EBS-1250 double-neck, which also belonged to Maurice Gibb, will also go under the hammer. Luke Hobbs, from Gardiner Houlgate auctioneers in Corsham, said Bee Gees' instruments are "exceptionally rare". "These guitars represent the two great phases of the Bee Gees' career. "The double-neck comes from the '60s and early-'70s when they sang popular ballads; the J45 represents their comeback and the disco years. "It's not often you get to encapsulate a band's career so succinctly in a single auction." A Maton guitar used by George Harrison at the Beatles' last appearance at Liverpool's Cavern Club in 1963 will also be auctioned in the sale of more than 400 guitars on 12 September.